I never intended to see this movie. My friend and I met at the decaying arthouse movie theater to see Coco Chanel and Igor Stravinsky. Even though it seems that the plot of the movie amounts to nothing more than composer fanfiction, I'm a big enough fan of Stravinsky that I wanted to see the film. As my friend put it, "At least the soundtrack will be decent." But something had gone wrong at the theater, and the movie was canceled due to technical difficulties. Rewarded with free ticket vouchers and with no real inclination to go home empty-handed, we decided instead to go into The Kids Are All Right, due to the joint combination of the A) It was playing at the same time as the movie we had intended to see, and B) It was the only other movie in the theater that was in English. I had skimmed over a few positive reviews, but I didn't really know what I was getting myself into. I was unsure if I really wanted to see a "lesbian" movie, but it was free and I had nothing else to do. But my hesitations grew as my friend and I took our seats, and I realized that we appeared to be the only men in the theater. Not only was this a lesbian movie, it appeared to be a bizarre crossbreed of lesbian chick-flick. I mention this all because I was even more impressed when the movie turned out to be very, very good. Movies like these have a marketing problem - they're generally advertised as appealing to a certain demographic, like gays or older women. 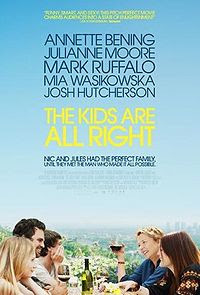 But The Kids Are All Right is far from a chick flick. Instead, in a summer in which I've seen nothing but behemothic blockbusters, this was a human movie. The plot, compared to most films that hit the theaters during the summer, seems rather benign. Jules (Julianne Moore) and Nic (Annette Bening) are two lifepartners living the suburban dream. Both became pregnant through in vitro fertilization, and now their oldest daughter Joni is about to go off to college, while their fifteen-year old son Laser is lashing out at everything with typical teenage iconoclasm. Now that Joni is eighteen years old, she has the legal right to discover who her genetic father is. Together with her brother, they track down the man that donated his sperm years ago - a shaggy, hippie-ish restaurateur named Paul (Mark Ruffalo). Their initial meeting is understandably awkward, but as their father slowly comes back into their lives, the kids' parents (referred to as "the Momses") become jealous and a little hurt. Hadn't they done a good enough job raising their daughter for the past eighteen years? This is the sort of movie that could have failed horribly had the characters remained locked in their stereotypes. Luckily, the screenwriters are smart enough not to let archetypes like "the butch lesbian," "the new-age lesbian," "the overachieving daughter" and "the dopish dad" weigh them down. These characters are all present in the first five minutes of the film, but are soon replaced by three-dimensional characters with surprising emotional depth. It helps that the acting is top-notch, even with the teenage characters. Moore and Bening conduct themselves like any married couple who has been together for twenty years - still in love, but a little weary from the journey. The two children act as any children would in this situation - confused, excited at the prospect of a "cool" parent to go visit, ready to rebel against the parents that raised them. The movie is a comedy, but not necessarily a laugh-a-minute one. Rather, The Kids Are All Right goes for the knowing grin rather than the belly laugh. Scenes like the awkward conversation between Joni and her newly-discovered sperm donor are delightfully true-to-life. And, most importantly, the strange family situation is never played up for laughs. True, the central characters are two lesbians and their sperm donor, but the film is smart enough not to play up this aspect with a heavy-hand. Instead, the characters conduct themselves as though, while not perfectly normal, their lives are average enough to not be considered extraordinary. The fact that the central characters are lesbians is tertiary to the main plot; the movie wisely treats the family's situation not as a mess to laugh and jeer at, but as a twist on the drama that a lot of families go through. The movie lags slightly in the third act, with several melodramatic monologues that tell rather than show, but the film at least avoids the group-hug happy ending that one might expect. Emotional damage, especially between family members, is not something overcome within two hours, and the film is astute enough to realize this. So my sojourn into the world of independent lesbian film turned out to be an unqualified success. It's hard to do this movie justice in a review - the premise still sounds awkward and contrived. Perhaps it is. But the movie is so well done that you won't even notice. Swallow your pride and go see it. You'll be glad you did.